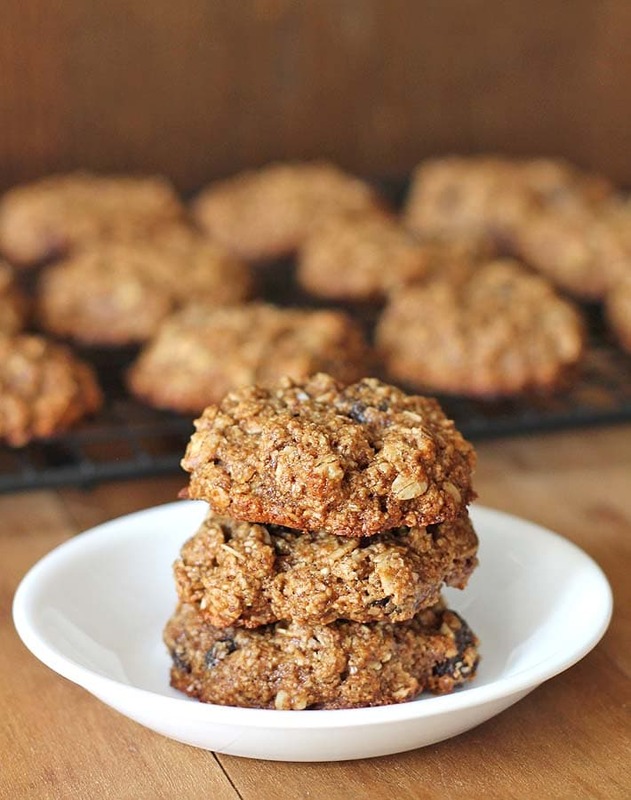 Soft-baked chewy vegan oatmeal raisin cookies loaded with raisins and subtle cinnamon flavour. These easy-to-make cookies also happen to be 100% gluten-free and they make the best snacks! So…are you #TeamOatmealChocolateChip or #TeamOatmealRaisin? I asked this question in my Instagram stories a little while back and really, I already knew the answer before I asked. 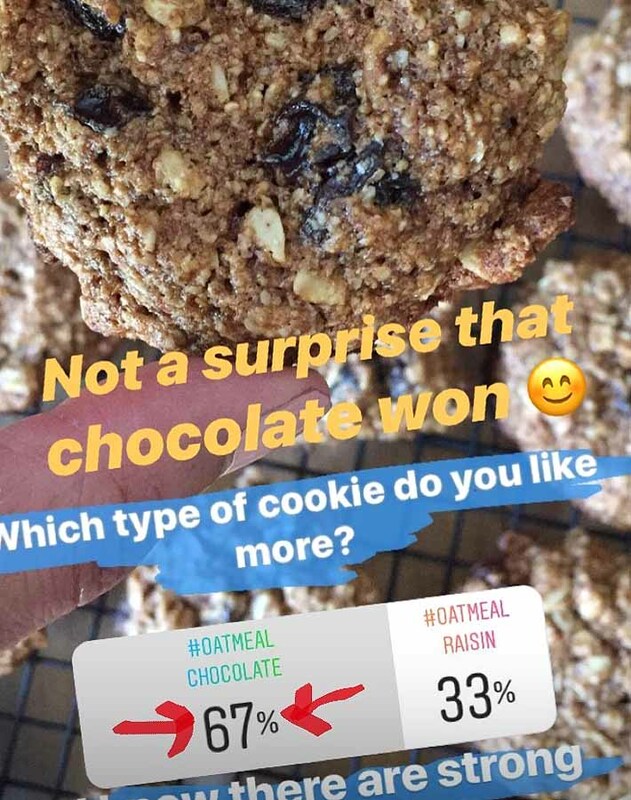 67% of those who answered question went for oatmeal chocolate. Not a shocker. I’m on both teams, I love both types of cookies equally. I like any type of cookie, if we’re being honest. However, as the poll shows, and from general knowledge, AND my family’s preference for non raisin things, I know a lot of people have a hate on for raisins. 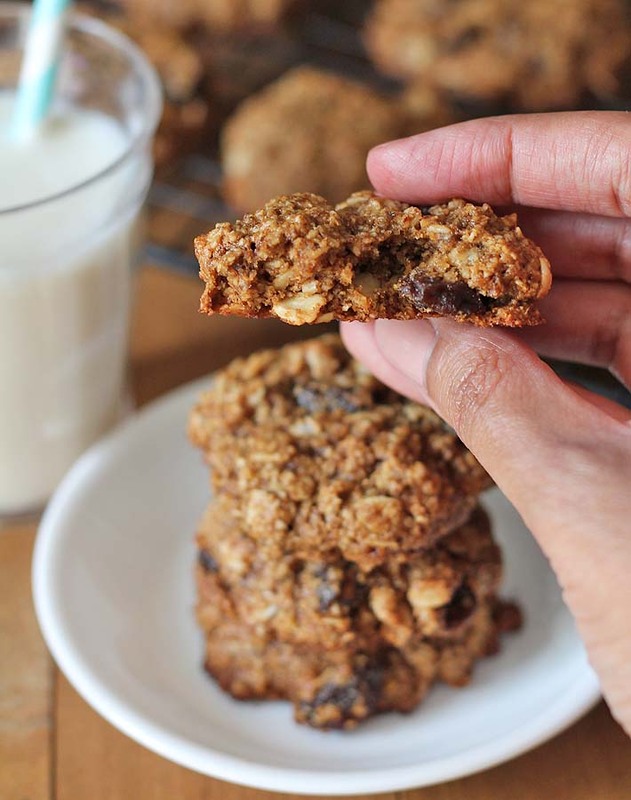 For those of you who don’t like raisins but are still with me here, this recipe for oatmeal chocolate chip coconut cookies is for you. 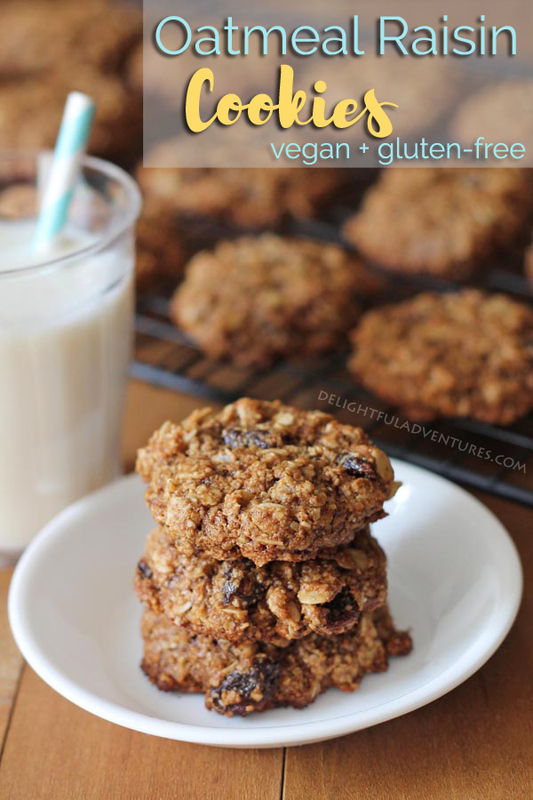 And if you prefer plain oatmeal cookies, then check out my plain vegan gluten free oatmeal cookie recipe. Go ahead, check those recipes out, no hard feelings. 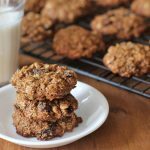 And if you ever get curious and you feel like trying a really good oatmeal raisin cookie, come back and try this recipe. Okay? 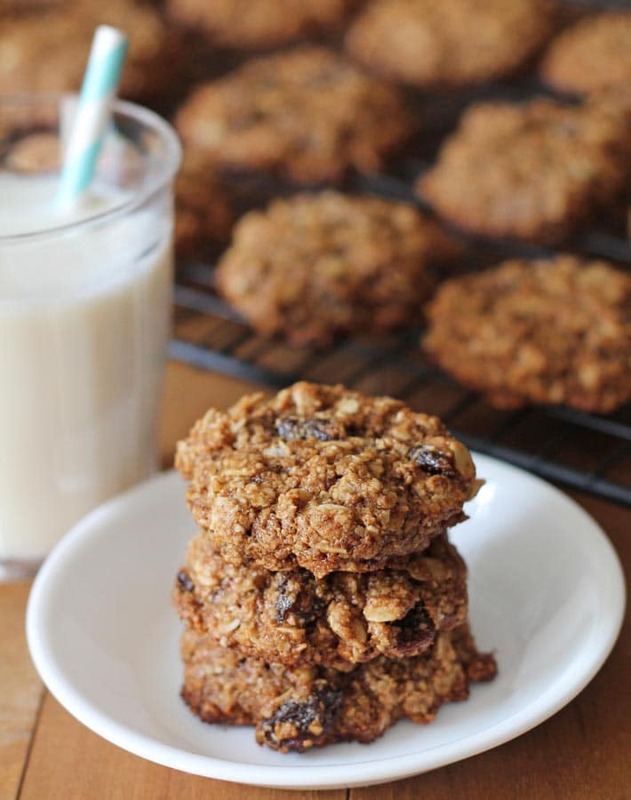 Now, for those of you who DO like raisins and oatmeal raisin cookies, this recipe…mmm…this recipe. You’re going to like it. They also have a subtle, really nice background cinnamon flavour. If you are a raisin fan, you already know that cinnamon pairs perfectly with raisins. If you don’t like raisins, or think you don’t like them, maybe what I’ve said so far, combined with all the drool-worthy images will convince you to try the recipe? I hope so! If not, we’re still cool, just be sure to check out that oatmeal chocolate chip recipe I linked to above. Can I use a different flour, other than oat flour, to make these cookies? I have not tried using any other flour in this recipe, so I can’t say for sure if any other would work. Is it possible to omit or replace the oil with something else? No, don’t omit the oil, it’s an important part of the recipe. I have not tried replacing it with another ingredient (like plain applesauce, a good oil replacement in some recipes) so I can’t say for sure if it would work, so keep that in mind. …please leave me a comment below or please tag me on Instagram and show me a pic! I’m @delightfuladventures 🙂 And tell me if you’re #TeamOatmealChocolateChip or #TeamOatmealRaisin …or #TeamBoth like me! Prepare your baking sheet(s) by lining with parchment paper. In a medium bowl, whisk together the oat flour, rolled oats, cinnamon, baking soda, and salt. In a large bowl, mix together the flax mixture, soft coconut oil, vanilla extract, and coconut sugar. Flatten each cookie slightly. Leave enough space around each cookie, they will spread a little as they bake. Leave cookies on the cookie sheet to cool for about 10 minutes, then remove and place on a cooling rack. 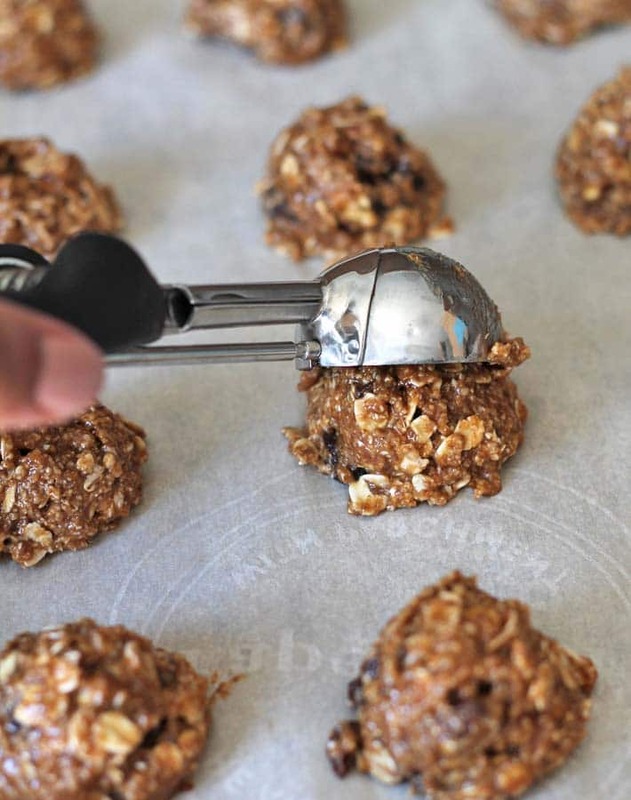 Calorie count is based on 24 cookies, which is the amount you will get if you use a tablespoon to scoop them out. If you make them with a medium sized cookie scoop, (medium scoops are usually 1.5 tablespoons), you will end up with less cookies. When I make them with a scoop, I get about 20). For this recipe, you want your coconut oil to be soft, not melted. Use either 1/2 or 3/4 cup of raisins, depending on how many raisins you like in your cookies. Cookies may seem under baked when you take out of the oven because they will be very soft. Not to worry, they firm up as they cool. Nutrition info listed below is based on one cookie. Nutrition info is only to be used as a rough guide. Click here to learn how nutrition info is calculated on this website. Just wanted to let you know that I used Earth Balance buttery spread in place of coconut oil with good results. Great recipe! Thanks. These cookies are very reminiscent of the buttery oat and coconut squares my mom used to make when I was a little girl. I’ve been looking for a GF version of them for a long time and was so glad to find this recipe that I baked a double batch – one of which was choc-coconut. I found working with the soft coconut oil very difficult so I melted it for the second batch of cookies. It work perfectly. I also made the second batch with ground chia instead of flax and it worked just as well. It also works fine with all purpose GF flour instead of oat flour (the way Mom used to make it). Thanks for the wonderful recipe. It’s definitely a keeper. I love that the cookies remind you of something from your childhood and that you like the recipe, Micky 🙂 Good to know about the subs you made, it’s helpful to know, thank you!